Art School is a fashion collective founded by Eden Loweth and Tom Barratt – who are also partners. 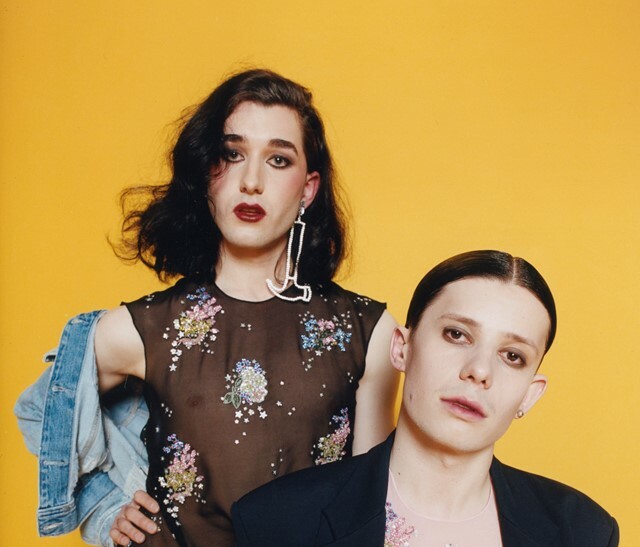 Working with friends across an eclectic mix of ages and gender identities, they create decadent, luxury clothes (“No one I know is really going to be able to buy it,” admits Tom) that embrace and accentuate the genderqueer, non-binary body. The closeness between the duo bubbles over into their interactions when they’re talking about the type of clothes they design. “It's about celebration, isn't it?” says Barratt to Loweth, who nods in agreement: “Yeah! It's about euphoric celebration.” “Like what a poo feels like,” giggles Barratt. Their first collection goes into store at Selfridges in summer 2017, but their first presentation – an organic, improv dance-and-sound-fuelled performance inspired by the Ballet Russes and Bauhaus – earlier in the year at Lulu Kennedy’s emerging talent LFW showcase, Fashion East.